When starting out on your journey to become a guitarist, the first thing to do is buy or borrow a guitar. If you can't borrow a guitar you will most probably have to make the investment and buy a guitar. 1. It is cheaper to buy a used guitar than a new one. This means you can afford a better quality guitar for your money. 2. If you find out that the guitar is not the instrument for you, it is much easier to sell a second hand guitar for the price you purchased it at. Therefore the chance of you losing money is smaller - in fact you may even make some money! Take someone with you that knows about guitars or that can play when you go looking for guitars to buy. Just like buying a car, having someone with you who knows about what you are buying can be a great help an potentially save you money! Visit some guitar shops and get the sales guys to talk you through various different guitars and how they vary across type of guitar and price. This should give you a lot of background knowledge before making your purchasing decision. The guitar neck should look like this - nice and straight. The action is the name given to the distance between the strings as they run along the fretboard. The strings should not be too far above the fretboard because this will make them too hard to press down when you get to the playing the high notes. 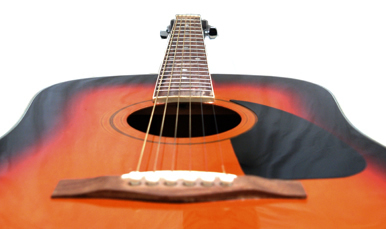 An electric guitar will usually have a lower action than an acoustic. The frets are the pieces of metal that run the length of the fretboard or fingerboard. Look along the neck to see if any of them are poking up or uneven. Once you are sure that they are all set properly in place, play each note on the guitar listening out for buzzing. If you hear a buzz, it means that the string is vibrating against a fret that is set too high - you probably wouldn't want to buy this guitar. Intonation describes the rise and fall of notes or tones across the neck of the guitar and you need to check that this is right. Ask whoever is selling you the guitar to tune it for you if it isn't already, then play an open string and listen to the note being played. Now press the same string down behind the twelfth fret and then play the string again. The note should sound exactly the same, only one octave higher, if it doesn't the guitars intonation is out, and this guitar should be avoided. Repeat this across all six strings. 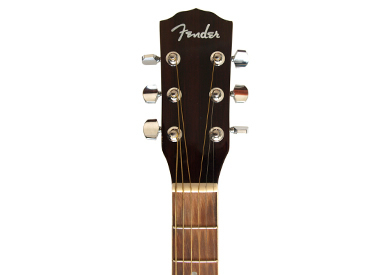 The guitar is tuned by turning the six small handles on the headstock. These handles are called the machine heads and are used to tune the guitar by adjusting the tension in the strings. Increasing the tension makes the tone higher, decreasing the tension makes the tone go lower. Check that the machine heads all turn smoothly and that they have an even resistance. Check also that non of the machine heads are loose or rattling. What does the guitar sound like? This is a really important question. The guitar needs to have a pleasing balanced sound, each note should have a similar amount of resonance or sustain. Sustain is a measurement of how long a note sounds before it fades away. This should be about even across the whole guitar, and the best way to check this would be to play every note on the guitar to see if they all sustain about the same. As you play each note ask yourself do I like the character of this sound? If you do you are another step closer to buying the guitar. Next give the guitar a good old strum. Listen out for any unwanted vibrations or rattles, if you can't hear any that's good news. All the previous checks can be made without having to use an amplifier. But if you are considering buying an electric guitar, now is the time to plug it in. Make the following checks without any effects on the amplified sound - you need to be listening to the guitars sound clean. Look at the pickups. If the guitar has more than one pickup you need to listen to the sound of each one individually by adjusting its volume. Listen to check that each string has a similar volume and resonance. If the volume and resonance of each string is not similar, you will need to adjust the pickup's distance from the strings. 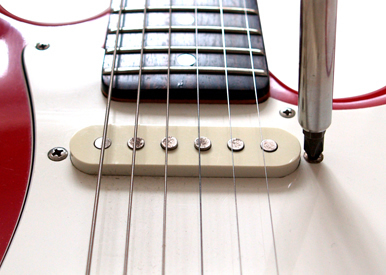 This is done by turning one or both of the pickup adjustment screws on either side of the pickup. The closer the pickup is to the string, the stronger the vibration that is "picked up", and the louder the amplified note becomes. 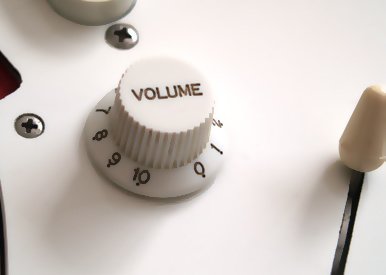 Listen for crackles as you adjust the volume and tone dials on the guitar. You will want to adjust these dials when you are playing, and a crackle could ruin your performance. Face the guitar towards the amp without playing any strings, and listen for any untoward buzzing. Avery quiet hum is probably to be expected, but anything louder could point to the electrical circuits in the guitar not being properly isolated leading to a potential repair. 10. Does the guitar feel good? It's hard to explain what you will be looking for here, as it is all about feeling. You are looking for a guitar that is a natural fit to your personality and style of music that you intend to play. When you find a guitar that is right for you, you just know it! We hope these tips have been of some use to you in choosing a guitar to buy.